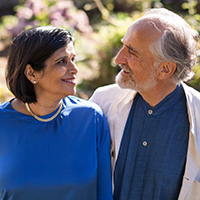 Arran Stephens and his wife and partner Ratana Stephens have fearlessly and passionately devoted their lives to the growth and success of the organic food movement. In 1985, they founded Nature’s Path Foods Inc. based in Richmond, British Columbia, Canada. In 1990, the company became one of the very first third-party certified organic processors in North America. Nature’s Path employs over 500 team members across the United States and Canada, and is helping to grow green jobs in the organic industry. It continues to be a privately run, fiercely independent family business. Both Arran and Ratana believe that the organic industry needs to work together in order to achieve success. As such, Nature’s Path is actively involved in many industry associations and working groups in both the United States and Canada. The Stephens have focused their lives on environmental stewardship with the health of people and planet as their first priority. Their many contributions include purchasing 2,880 acres of organic farmland to partner with farmers on a crop-share basis, helping found the Non-GMO Project, donating $20 million in money and food items to food banks, establishing a one percent fund for conservation and environmental projects, and funding a scholarship through the Rodale Institute’s Your 2 Cents Program.